"Tracking narrow behind. He said affected horses often look like they are 'walking on a cord,' placing their hind feet on the same line in front of each other at the walk and, even more so, the trot. A lateral walk. Upon walking an affected horse in a serpentine pattern, the front and hind limbs on the same side move forward at the same time, similar to a pacing gait. Haunches in/out. 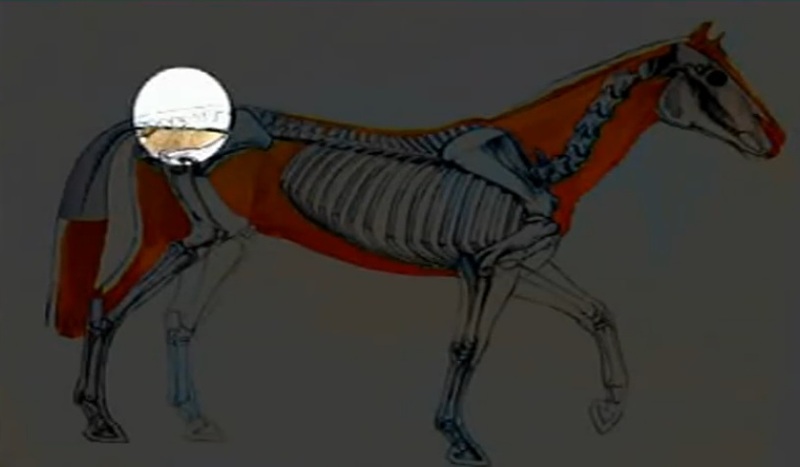 If you longe an affected horse in a circle, you'll notice that the hind limbs don't follow the same circle as the front limbs, with the haunches making a smaller circle than the rest of the body. Asymmetric tail position. When an affected horse walks in a serpentine, he will lock his tail to one side. Reduced lumbrosacral flexibility. Place one hand on the point of the hip and pull the tail toward one side, then repeat this on the other side. Also make the horse 'tuck under' by scratching each hamstring with a pointed object. A healthy horse's flexibility should be the same on each side." This link is a comprehensive article on sacroiliac disease in horses.